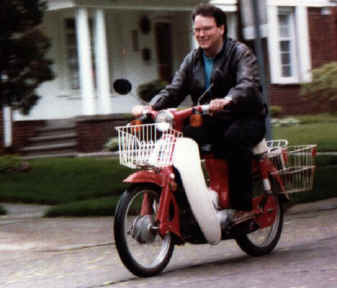 This section of the site is devoted to the Honda C70 Passport. It has manuals, tips, and history. For a lot more stuff, join the C70 Passport Club (click above). This turned out to be the only site in many search engines on the topic of Honda Passport Scooters, so I do get asked questions from time to time. I've started compiling the best of these so our bikes can continue to buzz on. Actually, I'm the 2nd and 4th owner of this magnificent vehicle. I bought this from my friend Marc back in '83, and drove it for a year in Ann Arbor, before graduating to a Honda FT500 Ascot. He was the first owner. My friend Debbie (who has a son named Noah!) bought it when I left town. 13 years later, she found me on the internet, and left a phone message. My son and I piled in the Scorpio, and headed east. A great day of tinkering with the bike while he drove around in Jonathan and Debbie's impressive collection of electric vehicles, and we succeeded in getting it running. Then we stuffed it in the Scorpio, with all the doors closed, no less, and drove it home. 100 pounds of groceries, beer, etc. Marc rebuilt the carburetor (this thing sure is easier to get parts for than a Scorpio) and we both putted around on it. Since then I've been chasing down its annoying tendency to blow out headlights, and trying to get the starter to work reliably. Yes, it has ELECTRIC START!! But the kick start is so easy you can do it with your hand. Progress report: Hey!! May 3 1998 I found the electrical bug!! Everything works! No more headlight troubles! Still needs a little work on the carb, but I'll take it. It's a great ride for trips to the video store, though it's a little bouncy. I suspect that's from back in Ann Arbor when Thor and I would load it up with 100 pounds of groceries, a case of beer, and a mop, and then drive the 550 pound load back to the house. The shocks are probably shot. Jonathan wants to sneak a snowmobile engine into it and make it into a superbike killer. I dunno.